I'm interested in your product. I have a few multipage pdf files (contracts of different mobile network companies / products). There are already mapped (usable) PDF-fields on it. I want several salespersons to fill particular fields on this contracts (not all!) with their customers with an iPad and mobile connection. Then they should sign it (also on iPad) to verify. Then the complete form should be sent via mail to me or saved inside dropbox. I have an own domain and could also generate subdomains for each form. - Does this work in iPad? The current version of "Online Document Annotator" is not support email option yet, however, we will add this function into the next version of "Online Document Annotator" application. Yes, the purchased version does accept APIKEY, this APIKEY will be used to identify users. Sorry, our "Online Document Annotator" hasn't this function yet. >>- Does this work in iPad? Yes, "Online Document Annotator" does work on iPad. >>- Is it possible to embed this in my own pages and style it via custom CSS? Yes, you can embed "Online Document Annotator" into your website via an "iframe" html code, this can be done easily. 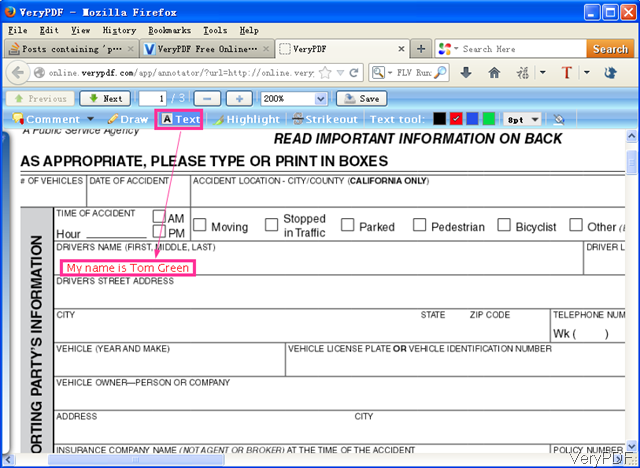 How to stamp barcodes to a PDF file and fill the PDF forms? How to combine FDF and PDF file into a new PDF file programmatically? Merging .fdf files. How to merge .fdf and .pdf files together? How to use C# .NET to open a PDF form, pre-fill (or populate) the on-screen form, and make edits (text, checkboxes, etc.) to the online form, then have a SUBMIT button on each page to save the edits back to the database? How to insert XML file into PDF forms by PDF Toolbox? How to upload standard PDF form allowing users to fill out directly? Can I fill an editable PDF with FDF? Will PDF form Filler read data from MySQL Database? How to fill PDF forms with VB? This entry was posted in PDF Form Filler, VeryPDF Cloud API and tagged fill form, fill PDF form. Bookmark the permalink.